Webelos Scouts that earn the Chess Belt Loop while a Webelos Scout also satisfy requirement 8 for the Scholar Activity Badge. 1) Identify the chess pieces and set up a chess board for play. 2) Demonstrate the moves of each chess piece to your den leader or adult partner. 3) Play a game of chess. 1) Demonstrate basic opening principles (such as development of pieces, control center, castle, don't bring queen out too early, don't move same piece twice). 2) Visit a chess tournament and tell your den about it. 3) Participate in a pack, school, or community chess tournament. 4) Solve a pre-specified chess problem (e.g., "White to move and mate in three") given to you by your adult partner. 5) Play five games of chess. 6) Play 10 chess games via computer or on the Internet. 7) Read about a famous chess player. 8) Describe U.S. Chess Federation ratings for chess players. 9) Learn to write chess notation and record a game with another Scout. 10) Present a report about the history of chess to your den or family. · Beginner's Chess Page - want to learn to play Chess? Check out this page. · Chess for Kids - learn how to play chess with this ThinkQuest site! It includes basic tactics, more advanced strategies, and hints on tournament play. · Chess in the Schools - this foundation provides chess instruction and materials to children in New York public schools. · Chess is Fun - learn about chess tactics and openings, or view some of the greatest chess games ever played. · Chess Lover's Paradise - meet this young chess player and learn about the siamese and triamese versions of the game. · Chess Mentor - the Kasparov-Deep Blue Rematch: Put yourself in the players' seats and try moves for yourself! · Chess Tutorial - let Chessking.com teach you all about chess! Learn phrases of the game, how each piece moves and captures other pieces, combinations, and much more. · Chess Variant Pages - all the different versions of the game. · Club Kasparov - virtual home of the world's greatest chess player. · Duif's Place: Chess for Fans and Tournament Players - meet today's young chess superstars and find out how you can get started playing in tournaments. · Learn2 Play Chess - if you've always wanted to learn to play chess but were worried about all the rules, this site has clear explanations of the rules and how to play. · U.S. Chess Center - everything you want to know about chess. Keep checking www.boyslife.org to see when the 2009 info is published. Or better yet, sign up on the Boys' Life site for an RSS feed to let you know when it is posted!!! On my best dress uniform I have 13 knots which account for 15 or so different awards. On my plainest uniform I have three knots. The three knots I consider the most important in motivating a youth. They are my Arrow of Light, my Eagle and my Youth Religious Award (I earned the Pro Deo et Patra which required 150 service hours). I consider these important because they show the boys of today that as an adult, I am still very proud of my accomplishments as a youth. Now, an adult cannot earn any of these knots but they can still be awarded to him. When you recruit a new Dad, ask him if he was a Scout as a boy. And if he was, what he earned. If he earned his Arrow of Light or Eagle, go out and buy him the knot for his uniform and present it to him when you install him as a leader (or even if he has not signed up yet, buy him one and present it to him. Maybe it will nudge him over the line to sign up) Do it with flair and style. Make his son feel really proud of him. I have a gentleman in my Pack who earned his Eagle in Puerto Rico (The pack is in NJ), he will be getting an Eagle Square Knot at our next Pack Meeting!!! Many new to Scouting parents who are former Scouts, do not realize these knots are available. 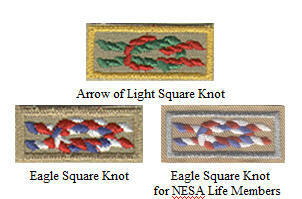 NESA Life Members may purchase and wear a special version of the Eagle Scout Square Knot with a silver Mylar border, as illustrated above. BUT only one Eagle Square Knot may be worn. Now, you notice I left out the Religious Award. This is because this knot may be worn by any Scout or Scouter that completed a religious emblem program as a youth member. They may have earned it in Girl Scouts, 4-H, Campfire, or other. It does not matter. The administration of religious emblem programs is conducted by the various religious organizations. The Scout's religious organization (local church) usually presents the religious emblem upon completion of the religious emblem program. Units then frequently honor the recipient with a presentation of the Universal Youth Religious Emblem Square Knot. Therefore, you need to include Moms as well as Dads in your discussion about these awards. If a lady eared the award as a youth, she can wear the knot. For the God and Country Series for Protestant youth, the program and awards are the same for boys and girls regardless of organization. This is a change from when I wrote National when my daughter earned her God and Me(1993), and they told me that even though it was the same award, she could not wear the Knot if she became a Boy Scout leader because she did not earn it as a Boy Scout. Now don't get me wrong. I am proud of all my knots. Each one represents a lot of work and a lot of time helping boys. I do wear them. Silver Beaver, District Award of Merit, Distinguished Commissioner, Scouter's Key, Cubmaster, and more. This summer at PTC I congratulated my friend Diane on her Silver Buffalo and Silver Antelope. She was very excited about them. She still serves as a Commissioner - so she can see Scouting in action at the boy level and make sure the message gets through. She knows it is getting the program to the boys that counts. You see a boy doesn’t care if you have been a good leader. He doesn’t care how many awards you have. He wants to an exciting program and to have fun. He wants to know what he is doing is worthwhile. So if you are a good leader with an exciting program and on top of that can show him as a boy you were a Scout, like he is and you are still proud of that fact, he will probably stay with you in Scouting. Translating that to Cub Scouting, if all you do is brag on your knots and you don’t run an exciting and fun program, it doesn’t matter how many you have - the boys will vote with their feet.